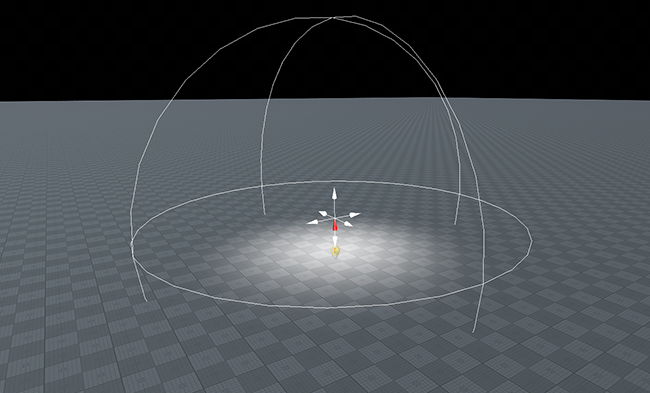 The omni light is a point source emitting light in all directions (360 degrees) and realistically reproducing shadow cast. They serve to simulate the sources with bright center and equal roll-off of intensity. As the example of such a light can be mentioned an ordinary household lightbulb, uncovered and hanging from a ceiling. This type of sources proves useful for general lighting purposes in the indoors scenes, because of its nondirectional qualities. 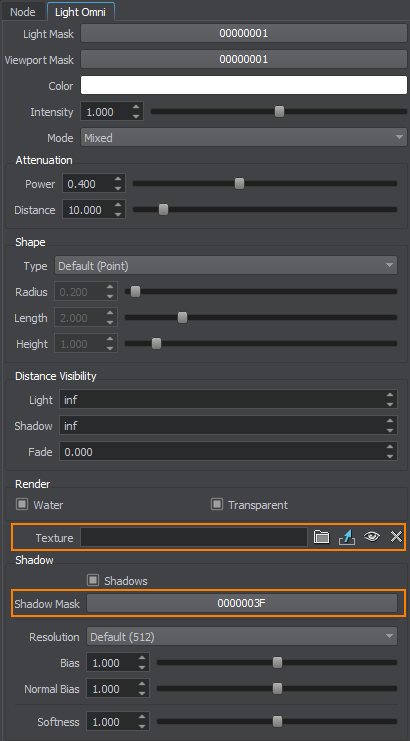 Please note that as omni light uses cubemap modulation, the shadowing by this source requires 6 passes and can be pretty expensive. As the omni light can have different shapes, it can be used to create area lights, for example, a realistic interior or street lights. 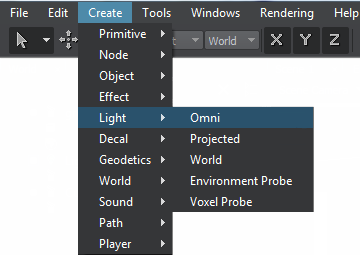 Parameters of the omni light can be adjusted on the Light Omni tab of the Parameters window. 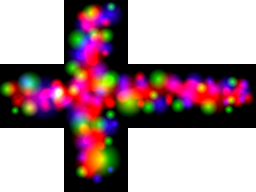 It includes both the common parameters and the parameters specific for the omni light source. The specific ones are described below. 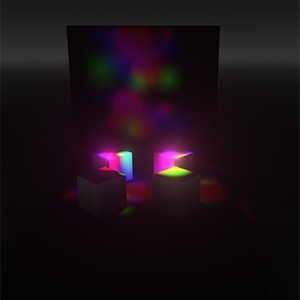 A cubemap texture projected by the omni light. Such modulations allow you to re-light the affected scene area in a new way at the same performance cost, create variegated light scattering patterns and, for example, imitate several light sources. 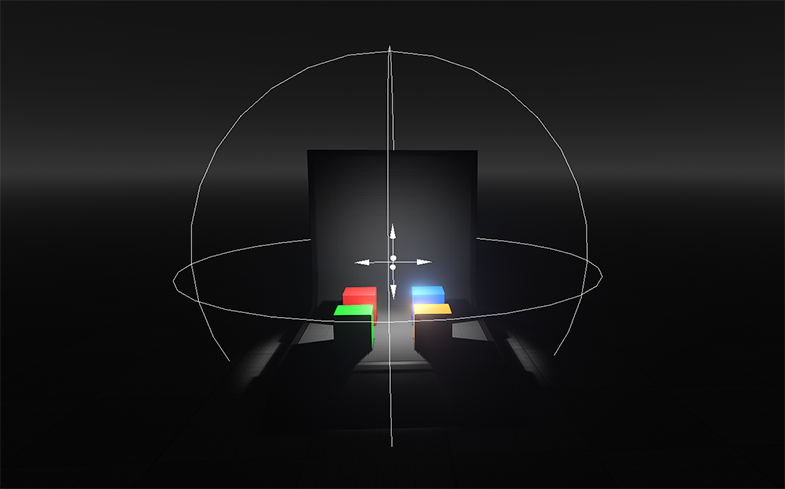 A shadow mask that defines shadowing of the 6 cubemap sides in the following way: positive and negative X-axis, positive and negative Y-axis, and positive and negative Z-axis. By default, no mask is applied.